Hall to laundry and back deck. 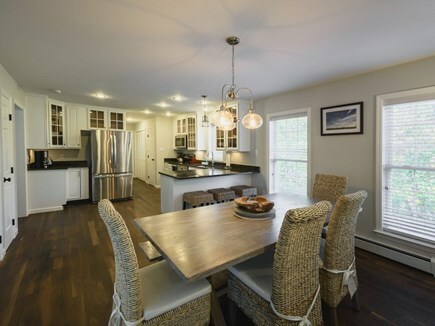 This newly renovated home is approximately 2100 sf with 4 bedrooms and 3 bathrooms. 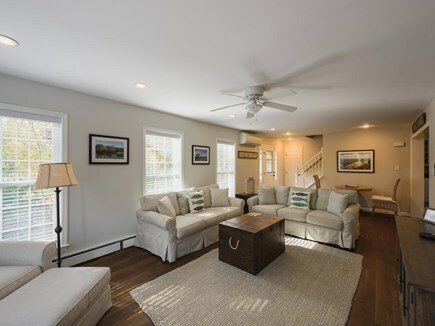 Furnished and decorated by an award winning Martha's Vineyard interior designer at Vineyard Decorators, this home features beautiful quality furnishings. The home is bathed in tranquil colors reflective of the Vineyard and its landscape. 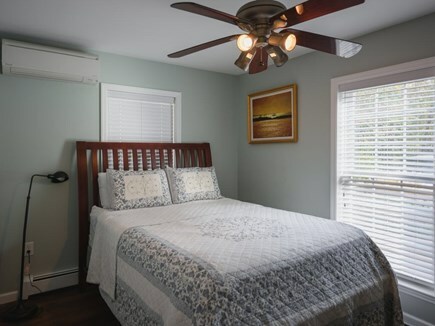 We are a 10 minute walk to downtown Oak Bluffs, the harbor and beaches. 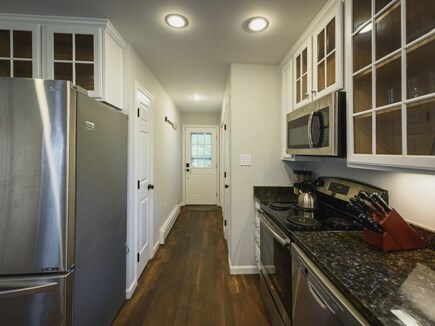 The home has everything new: new furniture, new central air conditioning, new kitchen and appliances, new hardwood floors installed throughout, newly painted and remodeled. 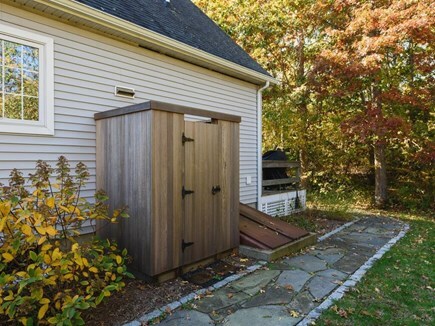 Outside you will find an inviting deck with furniture, a beautiful newly landscaped yard, patio with gas grill, and a private outdoor shower. 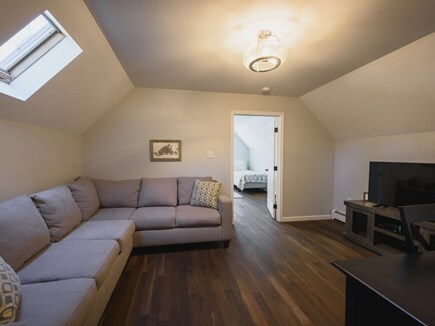 The first floor has an open floor plan with a spacious living room with a 65'' Flat Screen TV. 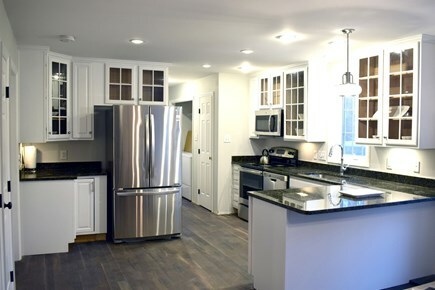 There is a newly renovated kitchen with a separate dining area, and counter with seating. 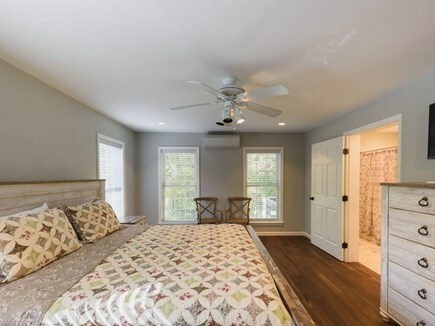 A large master bedroom with King bed, Flat Screen TV and a full bathroom that offers plenty of closet space, and a second bedroom with Queen Bed and Flat Screen TV. There is also another full bathroom. Walk up the stairs to find yourself in a large open living area that serves as a second TV/ Media room with sectional sofa and Flat Screen TV. 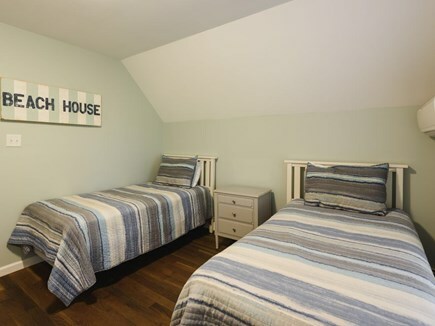 There are 2 additional large bedrooms with a full bathroom. 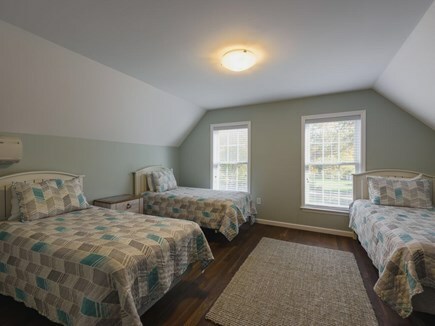 One with 3 twin beds and the other with 2 twin beds. 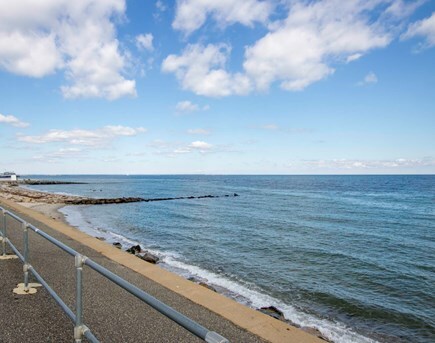 Our home is located 1/2 mile from the hustle and bustle of downtown Oak Bluffs. 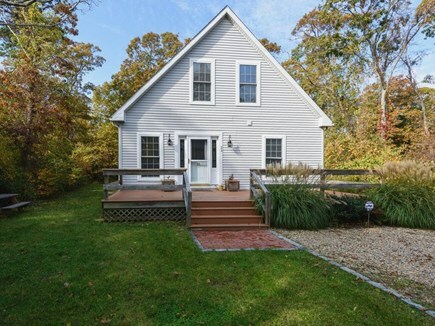 This location is unique as you are a short walk or bike ride away from everything that Oak Bluffs has to offer, yet you're far enough away to experience the peace and tranquility of the island. During the day enjoy shopping the boutiques along Circuit Ave, swimming in the ocean at the Inkwell Beach, strolling and dining along the harborside, then retreat back to the quiet solitude of our house. The walk to town is pleasant and safe, down residential dirt roads, easily avoiding major roads making it great if you are with kids! We are just a short distance to the County Road bike path, which connects to miles of island bike paths. 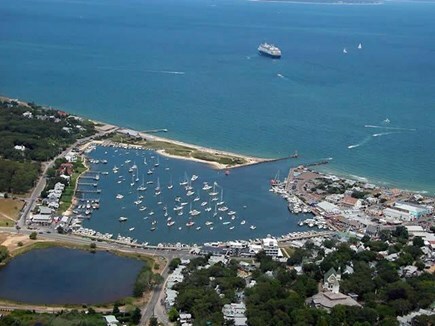 We are situated 2 miles from the Vineyard Haven Steamship Authority Terminal and .7 mile from the Oak Bluffs Steamship Authority Terminal, the Island Queen, and the Hyline Ferries. Additional pricing info: There is a $250 cleaning fee. There is a refundable $1000 security deposit required, State and local taxes of 11.7% will apply. 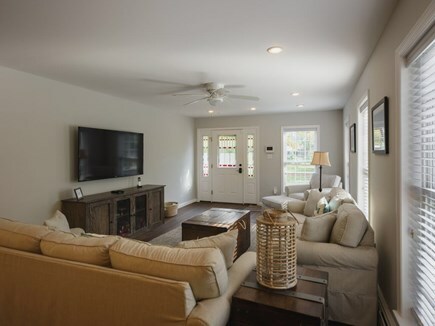 This newly renovated and newly furnished home has all the modern conveniences one would expect in a vacation rental, while still honoring the charm and relaxed atmosphere of the island. The home is in the perfect location as you can walk or bike to town, the beaches and the harbor, and return to the serenity of this home, which is situated on a quiet road and provides a quiet enjoyment into the evening. Walk to Town restaurants, ferries, theaters, beaches and harbor. Oak Bluffs, or “OB”, crowds flock to Circuit Avenue & harbor, day and night. The marina, carousel, gift shops, ice cream parlors are much loved by day-trippers and seasonal visitors. After dark, bars and live music venues make OB the beating heart of the Island’s nightlife. Many homes in “Cottage City” – where the town began as a Methodist revival retreat in 1835 - are historically significant Carpenter Gothic revival structures, America’s only original architecture. These Victorian-style, “gingerbread cottages” are listed by the Mass. Historic Commission, the Campground is listed on National Register of Historical Places. Vineyard Haven, or “Tisbury”, is the island’s year round port. The harbor is home to Black Dog Tallships, the boatyard, and hundreds of private vessels. Vineyard Haven’s downtown offers services year round, including shops, restaurants, art galleries, and is now part of the Vineyard Haven Harbor Cultural District. Stretching from the Vineyard Playhouse on Upper Main St., including the Martha’s Vineyard Museum and the Martha’s Vineyard Film Center– with lots of vibrant and entertaining art and cultural offerings in between. On the outskirts of downtown is Owen Park. It includes a park with playground and small public beach. West Chop Lighthouse has been guiding visitors safely into the harbor since 1818 and is on National Register of Historic Places.